A fantastic model of a baby Velociraptor (Stan) by Rebor. A wonderful Rebor baby Velociraptor (Stan). A hand-painted, museum quality replica of a baby Velociraptor. 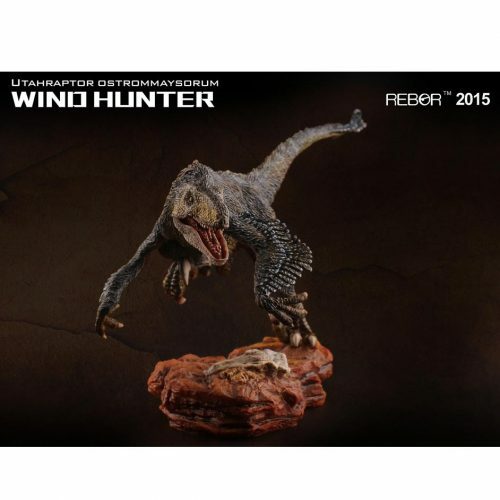 A Rebor 1:18 scale baby Velociraptor (Stan), part of the Rebor Scout model series. Height of model on base 5.5 cm approx. Length of model 8 cm approx. Width of base 3.5 cm approx. The model is very nice. Great detail and paint work. His right foot is bent/turned inwards a little, as it wasn’t clipped into the clear plastic carrier properly, but i am hoping i can straighten out his foot using some hot water on it. I’m sure this problem will just be a one off with my model and its the manufacturers fault, nothing to do with everything dinosaur. Its well worth the money and i highly recommend it.